Isn't it amazing how blessed social media is with so many experts in International Law? This is especially true when it comes to Israel. You can always find people who have never been there, show absolutely no knowledge of the land, its people or its history -- yet are perpetually prepared to offer their expert opinion on the knottiest issues. On the other hand, you can also find people in the Middle East who believe themselves expert in matters of international law when it comes to countries far away, such as in the US. Kuttab, a Palestinian Arab, is a journalist and a former professor of journalism in Princeton. So he knows a thing or two about journalism -- but not about international law. During the August 9, 2001 Sbarro massacre, masterminded by Hamas terrorist Ahlam Tamimi and carried out by Izzadin al-Masri, 15 people were murdered, including 8 children and 130 were injured. Another victim remains in a coma. Three of the victims were Americans, including Malki Roth. Tamimi was caught and her remorseless grin while exulting in retelling the story of her terrorist attack appears all over YouTube. Tamimi was sentenced to 16 life terms. And that should have been the end of her story. However, Gilad Shalit was kidnapped on June 25, 2006, by Hamas terrorists who extorted Israel and refused to release Shalit (even refusing visits from the Red Cross) until Israel agreed to exchange over 1,000 Arab prisoners for Shalit's release on October 18, 2011. Ahlam Tamimi was one of those prisoners. Tamimi did not complete her sentence. Nor did she receive a pardon. Ahlam Tamimi release was a conditional commutation. All those released were freed on the condition that in the future they do not engage in either terrorism or incitement of terrorism. In fact, dozens of the terrorists who were released under the Shalit ransom deal have since been sent back to prison to serve out the remainders of the terms over the past five years due to their violation of those conditions. For her part, immediately upon her release, Tamimi began violating the terms of her commutation by inciting terrorism by giving interviews where she has rejoiced in her terrorist attack and its results, bragging that she would commit that massacre of children again if she could. But since she lives in the welcome arms of Jordan, Tamimi is untouchable and out of the reach of justice. At least until the US Department of Justice unsealed an indictment of Tamimi for her role in murdering US citizens. As per its 1995 extradition with Jordan, the US requested that Tamimi be handed over for trial. Since then, Jordan -- which has treated Ahlam Tamimi like a celebrity, despite her deliberate murder of children -- has given a number of excuses for not complying with their treaty with the US. One of those is Double Jeopardy, that because Ahlam Tamimi was tried and convicted in Israel, she cannot be tried by the US and therefore the extradition treaty does not apply. Kuttab is no lawyer, and clearly has no knowledge of the principle of Double Jeopardy -- and the exceptions that apply to it. Arnold Roth, the father of Malki Roth, has written that he has spoken to legal experts who told him that Double Jeopardy does not apply in this case because Tamimi would be tried in a different country and with different charges. Let's take a look at some sources. On the actual extent of this principle, we have the explanation of The United Nations Human Rights Committee, which is a UN body of 18 experts established by a human rights treaty -- the International Covenant on Civil and Political Rights. Article 14, paragraph 7 of the Covenant [on Civil and Political Rights], providing that no one shall be liable to be tried or punished again for an offence of which they have already been finally convicted or acquitted in accordance with the law and penal procedure of each country, embodies the principle of ne bis in idem. This provision prohibits bringing a person, once convicted or acquitted of a certain offence, either before the same court again or before another tribunal again for the same offence. What about that footnote, number 116? It gives 2 examples from previous opinions handed down by the Committee where it rejected the application of Double Jeopardy: Communications No. 692/1996, A.R.J. v. Australia, para. 6.4; No. 204/1986, A.P. v. Italy, para. 7.3. 6.4 The author has claimed a violation of article 14, paragraph 7, because he considers that a retrial in Iran in the event of his deportation to that country would expose him to the risk of double jeopardy. The Committee recalls that article 14, paragraph 7, of the Covenant does not guarantee ne bis in idem with respect to the national jurisdictions of two or more states - this provision only prohibits double jeopardy with regard to an offence adjudicated in a given State See decision on case No. 204/1986 (A.P. v. Italy), declared inadmissible 2 November 1987, paragraphs 7.3 and 8.. Accordingly, this claim is inadmissible ratione materiae under article 3 of the Optional Protocol, as incompatible with the provisions of the Covenant. 7.3. With regard to the admissibility of the communication under article 3 of the Optional Protocol, the Committee has examined the State party's objection that the communication is incompatible with the provisions of the Covenant, since article 14, paragraph 7, of the Covenant, which the author invokes, does not guarantee non bis in idem with regard to the national jurisdictions of two or more States. The Committee observes that this provision prohibits double jeopardy only with regard to an offence adjudicated in a given State. This does not contradict what has been said so far -- that sentence is talking about a case of "retrial for the same criminal offense." That is not the case here with the US extradition. That is because the US charge against Tamimi is not murder, it is "conspiring to use a weapon of mass destruction against U.S. nationals outside the U.S., resulting in death". Interestingly, the DC Circuit Court that indicted Tamimi is the same one that handed down a ruling in 2017 rejecting the application of Double Jeopardy in the case of United States v. Trabelsi -- the case of Nizar Trabelsi, who fought extradition from Belgium back to the US to face charges after he had actually finished his prison term in Belgium. That court is well familiar with the principle of Double Jeopardy -- and when it does not apply. Also, former federal prosecutor and Washington lawyer Nathan Lewin argues that just as Double Jeopardy does not apply when a fugitive flees, it should not apply in this case where Tamimi was let go because of extortion. 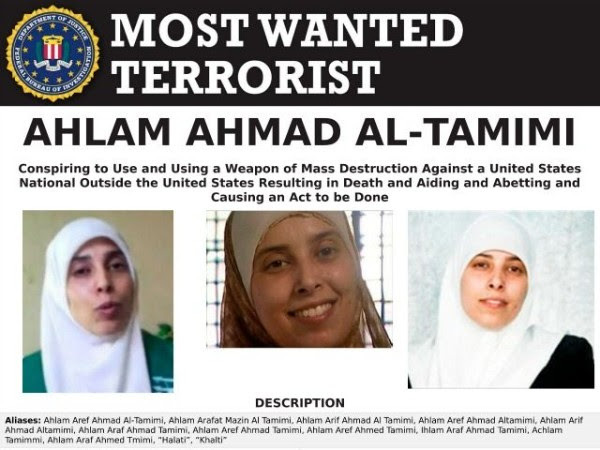 There is no issue of Double Jeopardy here in the extradition of the Hamas terrorist Ahlam Tamimi to the US. The only thing that is really in jeopardy is justice.